The modern game of golf was first recognized as a sport in 15th century Scotland. Players originally carried their clubs around bundled with twine or cord. 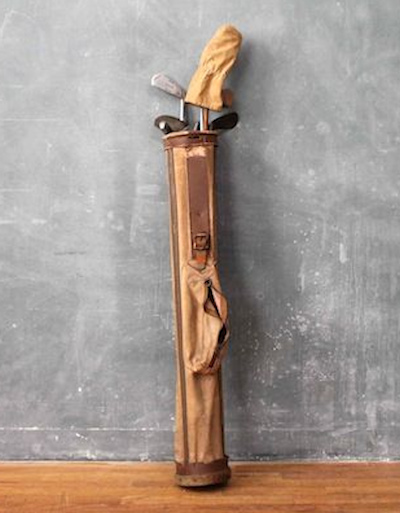 The first club carrying bags became popular in the early 1900’s and were about the size of our current pencil bags. They were designed to carry a limited number of clubs and just a few accessories such as a few extra golf balls. Back then most players only used 6 to 8 clubs anyway, with names such as brassie, mashie, cleek and spoon. When the Rules of Golf were originally codified in 1744 there was no need to limit the quantity of clubs. The options were so few. In the late 1920’s as tournament golf became more popular and professionals began tinkering with their clubs, the quantity of clubs ballooned out of control. Some caddies were carrying multiple bags as there was no limit on the number of clubs a player could use. In the 1935 US Open and US Amateur events, the average number of clubs carried by a single player was 18! One player even brought 35 clubs – both right and left handed varieties! In an attempt to create uniformity, fairness, and consistency, Rule 4-4, the 14 club rule, was implemented in 1938. Once this rule was established bag manufacturers could begin standardizing the bag dimensions to accommodate the now defined club limits. The original bags were shapeless and made from canvas. Later, leather was added creating a bit of structure to the bags and eventually metal was inserted to maintain some shape. As industrial machinery, design processes, and raw materials improved, the bags were made with heavy cotton and vinyl. Today golf bags use internal plastic frames and are made from lightweight leather, vinyl, nylon, and nylon mesh. They come in a variety of sizes and weights. Staff bags are the largest and weigh about 12 pounds, whereas cart bags are slightly smaller and weigh about 7 pounds. The carry or stand bags are the smallest with some weighing in as light as 3 pounds. Common among all these bags are the dividers which space your clubs in the bag. Often ignored is the condition of these dividers. Not only are they important for keeping your clubs organized but they also protect your shafts. If the dividers are worn and the surrounding material of foam and cotton has decomposed, then the paint and occasionally the graphite on the shaft gets scratched and erodes the integrity of the shafts. If only the paint has been scrapped off that is more of a cosmetic problem than one of structural integrity. The paint on shafts is generally topped with a clear coating. If the clear coating or paint is scratched or chipped that will not affect the performance of the shaft. However, if the graphite or carbon fiber is worn or splintered then the shaft is weakened and can break. You will know the carbon fiber is affected because it will have small indentations or may be splintered. Simply run your finger across the shaft and you can feel the difference. Be sure to regularly check the quality of the dividers in your bag because this will extend the life of an important investment: your golf shafts.